Every moment spent in the Condoriri region makes the mind grow calmer and the heart beat deeper. I will never forget this place. Today was a slow, lazy recovery day, which I welcomed though other climbers were antsy to get moving again. We bussed to Refugio Laguna Tuni to set up camp for the night. The Refugio was in disrepair with several windows missing in the main room. Richard and Jaime worked diligently and creatively to patch the windows for us to keep the cold wind out while most of the group went out on day hikes to acclimatize to the area once again. I chose to stay behind and read my book in the sunshine. After tea time, a few of us gathered around the dining table to catch up on some journaling. The toilets in the Refugio weren't working, so Augustine, one of our porters and assistant chef, built us an excellent toilet outside with view of Huayna Potosi. Our beautiful pit toilet with a stunning view of Huayna Potosi. Erin-Leigh Hardy. Dinner was great and conversation was very spirited. Having Jaime on the team added twice as much laughter to the table! He's a funny guy and a great guide. We woke up with the sun, around 8:30 and were on our feet by 9am. 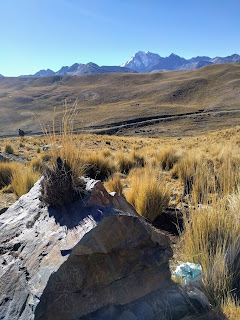 We hiked from Refugio Laguna Tuni to Chair Khota, where our base camp will be for the next 5 days. The hike was very pleased and scenic - another blue bird day! We saw a couple of other climbing groups along the way, for the first time all trip. We took a long break at the shores of Chair Khota. The water was so calm and clear that there was a perfect reflection of the Condoriri mountains. Richard pointed out that this group of mountains were named after the condor because the three central peaks resembled a condor, with the most central peak The Condor Head. Glistening peaks and reflective waters at Chair Khota. Erin-Leigh Hardy. A panoramic view of our base camp at the base of the Condiriri Mastiff. Erin-Leigh Hardy. 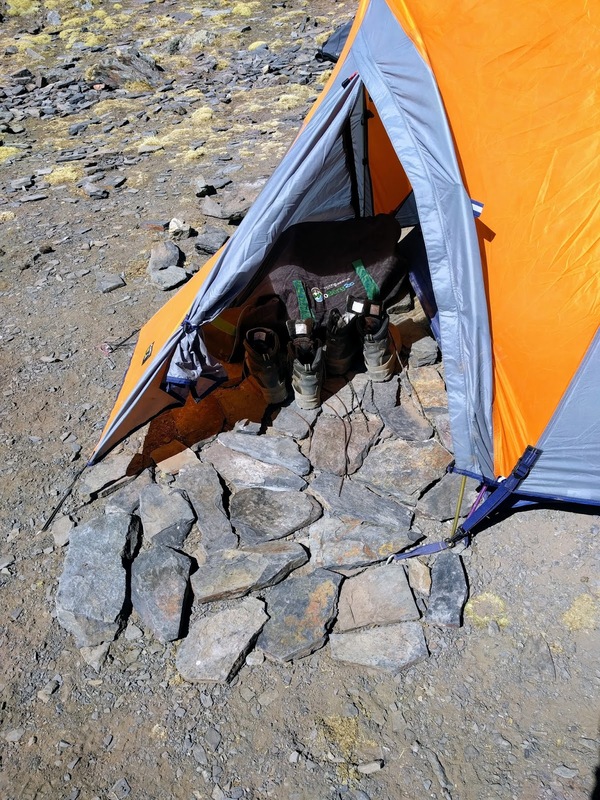 3 of the tent teams had the genius idea of tiling their vestibules with the flat stones found around camp. Erin-Leigh Hardy. At 2:30pm, most of the group went to the tow of the glacier below Cerro Tarija to start our skills practice. 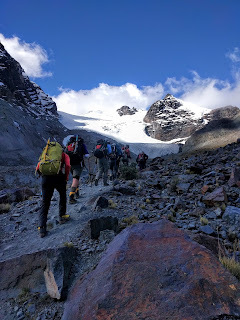 The group approaching the Cerro Tarija glacier. Erin-Leigh Hardy. Richard, Jaime and Banito lead the skills practice. We reviewed 'flat footing’ with just boots, how to use an ice axe, how to walk on a glacier with an ice axe and trekking pole and a few minutes of walking with crampons. Skills practice ended when the sun went behind Pick Austria and the area became very cold. The group practicing the various styles of flat footing. Erin-Leigh Hardy. When we got back, there was hot water and tea waiting for us. A very pleasant thing to come 'home’ to. 6 of us played a rousing game of cards before dinner. Dinner was great, sausages, mashed potatoes and veggies. We all went to bed early that night in preparation for an early morning. Day 11: Ascent of Pico Austria and Erin-Leigh's Return Home. Easing into the Alpine Starts, we woke up for breakfast around 5:30am, though most of the team woke up earlier than expected. Perhaps out of excitement for the upcoming climb on Pico Austria. I said my goodbyes to the group before they took off. I was greeted by big hugs from most of the group. It was harder to say goodbye than expected. I will miss this bunch very much. At 9am, I said goodbye to Hildago, our driver and head chef, and he gave me a big hug and said 'see you soon!’ then Augustine and i took off toward the Refugio 'at the end of the road’ (I don't know another name for it). We had a peaceful 2 hour hike. Diego and his mother meet me at the end of the road and I said goodbye to Augustine, again, with a big hug. I was awake during the drive through the countryside (for the first time all trip). It was really interesting to see old buildings, built out of clay that were deteriorating alongside newer houses made of the popular red bricks you see in the cities. I wonder how old those clay structures are. Coming into town was crazy as usual. I took some videos of Puente and El Alto to show the folks at home because no deception could do it justice. Now I'm back at the hotel, getting rest before my early morning flight home. I wish the group the best of luck in weather and health on the rest of their adventure! A full group photo on Day 9. Erin-Leigh Hardy.